Whew, what a weekend! I was off Thursday and Friday since Jacob was on spring break, and at the last minute B decided to take off Friday as well so we could have a little weekend getaway in ATL. Thursday Jacob and I had the day together, so we kicked it off the same way that we always kick off our days o fun with breakfast at Panera! He loves their cinnamon rolls and I love their cinnamon crunch bagels! 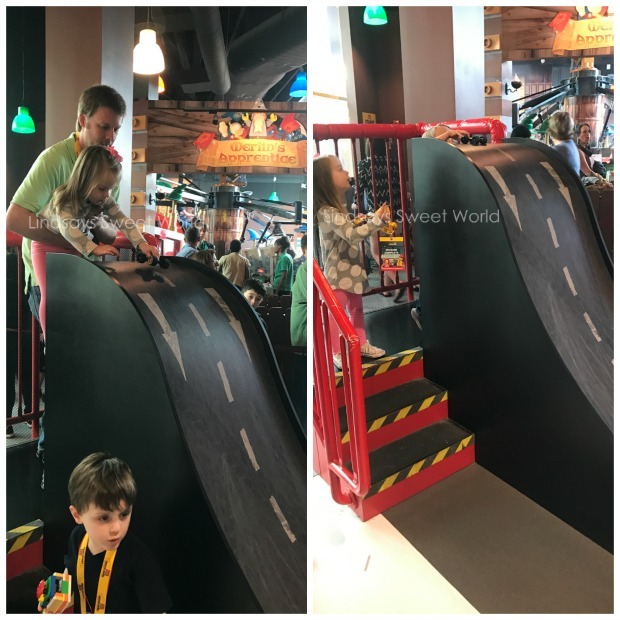 After Panera, we ran a few errands – Hobby Lobby, Marshall’s, Pier One, and Bath and Body Works, and then we went to the new entertainment center that he loves so much to play some arcade games. He ended up winning the jackpot on two different games and he got first place in one of the racing games, so he had loads of tickets… more than he’s ever had at any place like this! When we checked his balance, he had 299, so I bought a few more credits so he could break 300. He ended up with nearly 400 at the end, and he was able to get a dart gun off of the wall of prizes. It was a pretty big deal considering he usually only has enough for candy or rinky dink plastic junk. Haha. Needless to say, he was really happy. We spent the rest of the day getting a few things done around the house, and then we picked Olivia up early to surprise her since she had a major withdrawal freak out when she had to leave me that morning. I took them both to get frozen yogurt, which was so. flipping. hard. since I gave up desserts during the week for Lent. We spent the rest of the evening packing for our trip and wrangling two extremely hyper kids… I think the combination of the froyo and the fact that we were leaving for Atlanta the next morning was just too much for them. They were ca-razy. We got up bright and early Friday morning and headed out for ATL… but not before stopping for… donuts. Because #roadtrip. #duh The kids started laying across the chairs in DD and B and I were cracking up because it looked like they were planking. Do y’all remember that trend a few years ago? So strange. The market also connects to “The Beltline” which is a 22 mile walking trail that weaves through ATL. The coolest part about The Beltline is that they let local artists paint huge murals on old buildings/underpasses/bridges all along the trail. There were a few that I really wanted to see, but unfortunately they are just too spread out. After about a mile, we were all miserable – the kids were whining that they were tired and it was super windy and cold which was miserable to me – so we headed back to Ponce City Market without seeing any of the main murals that I wanted to see. We did get to see a couple of cool ones, though. By the time we got back to the market everyone was hungry, but the kids were whining that they didn’t want anything there, and they also didn’t have much to offer in the way of meatless stuff (we’re Catholic and don’t eat meat on Fridays during Lent) so we headed out to find something else. What do you do when everyone is hangry and everyone wants something different to eat? Why, you head straight to Cheesecake Factory, of course! Their menu is like a freaking book, and they offer anything you could ever want to eat. It was the perfect choice and everyone left full and happy. After we left, we stopped by the Nike store in the mall and the Sprinkles cupcakes ATM because I just HAD to get a picture! The next stop was the hotel. Olivia still has to have a nap every day and she refuses to nap in the car or stroller, so we settled in for a couple of hours so everyone could rest. When she got up, we googled playgrounds near us so we could let the kids run off some energy. We ended up finding the nicest public playground in the swankiest area of town (we were staying in Buckhead) and we let the kids play with all of the rich kids of ATL. LOL. Seriously, the playground was in a neighborhood with houses that had to have been at least 8,000 square feet. They were huge. The one right next to the playground was four stories. I mean, what?! We let them play for a good hour and then we headed to dinner. Last year on one of our trips to ATL we ate at a Mexican place called Tin Lizzy’s and we LOVED it. They have three different locations in ATL, so we tried a different location (in Buckhead) this time, and it was ah-mazing again. I was worried that I had hyped it up too much in my head and that it wasn’t going to be as good as I remembered, but I was happy that wasn’t the case at all. If you’re ever in ATL – GOOOO! And make sure you order their trio of salsa, queso, and guac. BEST EVER. And their chips are like crack… they sprinkle some kind of spices on them that taste like heaven and you won’t be able to stop eating. They also have an extensive specialty margarita menu, so B and I decided to partake. I had the Blood Orange and he had the Ginger Marg… both were so yummy! The vibe there is great, too. It’s open air and they had live music. Olivia ate her weight in queso and chips and Jacob had a blast drawing different things on his kids menu. It was a nice and laid back dinner… perfect for vacay. Afterward, we went in search of ice cream, and we ended up going to Jeni’s (another place that we had gone on one of our trips last year) and it was as delicious as we remembered, as well. Their Brown Butter Almond Brittle is one of the best ice creams I’ve ever had in my entire life. Divine. After ice cream, we called it a night and headed back to the hotel. The kiddos watched a little TV to wind down, and then it was lights out. Saturday we got up and decided to eat breakfast at the hotel since it was convenient and free. We were not impressed. The service wasn’t great, we had to wait forever for plates, and they were struggling keeping food out, so we definitely won’t be doing that again! After breakfast we headed to the main attraction of our weekend – Lego Land! Jacob is completely obsessed with Legos right now so we knew it would be the perfect place. We arrived right when they opened and we toured the entire thing. 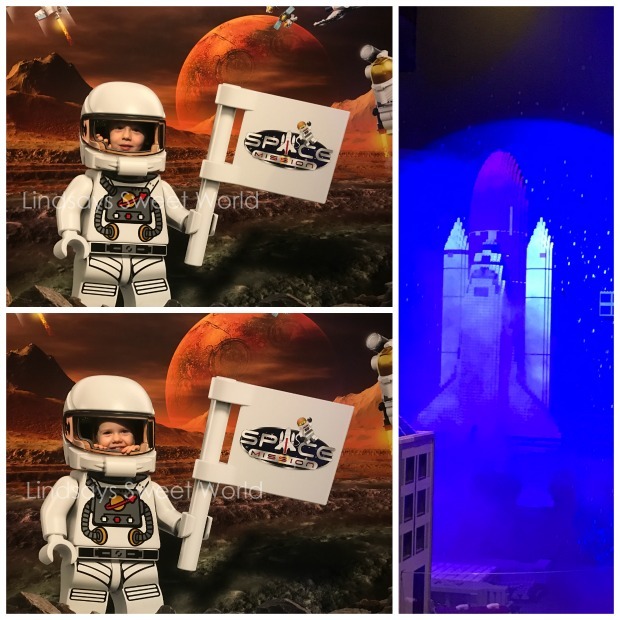 We discovered our weight in Lego bricks, we saw a Lego rocket blast off, and we saw the big Lego city. It was a whole room full of buildings from Atlanta (The capitol building, The Westin, The Georgia Dome, the Braves stadium, The Conservatory, The Varsity, The Georgia Aquarium, etc.) They had the lights up some of the time so it looked like daytime, and then the lights would go low so you could see the city at nighttime. They also had a fireworks show at night. It was awesome and it was definitely my favorite part. We also rode both rides, we watched the 4D movie (it’s 3D and it also includes wind and rain and snow, hence the 4D), let the kids play on the playground, and then we ended the trip at the Lego Shop where each kid picked out something to take home. Jacob chose a Batman vehicle from The Lego Batman movie and Olivia chose a Moana Lego Boat. Lego Land is in Phipps Plaza which is a high-end mall, so we stopped for lunch there and then did a little browsing. I love browsing places like Lily Pullitzer and Kate Spade since we don’t have them here at home. After that we hit the road and headed home. Olivia thankfully fell asleep and was able to get in a good nap before we arrived back at home. We had a low-key evening unpacking, getting Carrabba’s takeout and catching up on some shows. I did bring home a souvenir for myself… a Volcano Candle from Anthro! I’ve been wanting to get my hands on one forever, and since they had one there, I was finally able to smell one. I was thrilled because it smells almost exactly like my favorite candle of all time that was discontinued by Yankee Candle a few years ago – I can’t even remember what it was called now because it’s been so long, but it smelled like vanilla and orange and something else? So so wonderful. We also found Olivia some of the cutest Nikes I’ve ever seen and I’m so jealous that they don’t have them in my size! These are exactly what I’ve been looking for for myself but they don’t have anything like that! How cute are these?! Sunday was a day to spend with family. We had lunch with B’s fam and the kiddos played in the garden, and then we had dinner with my family. It was such a great weekend, and now unfortunately it’s back to work we go. Why is it always extra hard going back to work after a long weekend? Sigh. Happy Monday! What a great little getaway! Your mexican dinner and ice cream sound so delicious. And lego land sounds like a ton of fun!! Ending the weekend with family just sounds like the best. Happy Monday! Oh my goodness!! It looks like you all had a blast!!! And is that your garden in those last pictures!! I am so jealous of all the beds you have!! No, that's my MIL's garden. They plant all kinds of things - tomatoes, jalapenos, okra, spices, strawberries, blueberries, different kinds of lettuce. It's awesome! I unfortunately don't have a green thumb so I would never be able to do this! What an awesome weekend!! I'm so happy you guys got to go Lego Land!! It looked like the best time!! Y'all hit up some of our very FAVORITE places in ATL! We LOVE Tin Lizzy's! WE usually go to the one at the Mall of Georgia! We have been to Lego Land a few times and this year Ella's class is taking a field trip there! SO much FUN! I really want to walk the Beltline! It looks so cool! Have a great week! Cause y'all had a fantastic weekend! Thanks for linking up with us! What a fabulous little getaway. My boys loved the Legos so much that they would still probably love a visit to Legoland to this day! Have I ever told you how photogenic your precious children are! Just love those smiles and a testament to what a happy family you have my dear! Happy Monday! You're right... they would probably still love it!! Brian and I enjoyed it! It was really cool! And thank you so much! You are so sweet! And the winner for the most fun this long weekend goes to you! Goodness, y'all know how to have a fun time. That Lego Land Discovery Center looks just like the one we took the girl to in KC that they loved SO much. I hope Monday is kind to you friend. Mondays after super awesome weekends are always hard. What a weekend!!! This post has tooootally convinced me to take a trip to Atlanta! There's just so much to do. Oh my gosh, and Lego Land looks like a blast! I have a friend that works at the Anthro at Ponce!! She used to teach with me and now works at Anthro full time! Glad y'all had a fun mini trip to ATL! What a fun trip! I wanna go to ATL! It's always been on my list of places to go! That cupcake ATM sounds like my jam! I need something like that by me! So much fun! My brother lives in Atlanta so we've been a few times but never to any of these places. We do have the Lego Land here though! You had one action packed weekend. I need to get better about photographing ours, we do so much and I just forget to take photos. Such a fun little getaway! So glad you guys had a good time! I wish we had some of those ATM's around us...talk about dangerous though! Looks like you guys had a great time in Atlanta. Great pics! Lego Land sounds so fun! What a fun day just you and Jacob! The Beltline in Atlanta sounded really cool - sorry that you had to cut your time there short. Hopefully you’ll be able to check it out another time! That playground sounded pretty amazing. I guess it would have to be in a neighborhood like that, huh? Lego Land sounded amazing. I’m dying to take Mila to something like that. A small Lego Experience place is opening near us next month that we may have to check out! Sounds like you guys had such an amazing weekend! Enjoy your week, Lindsay! What a great trip! 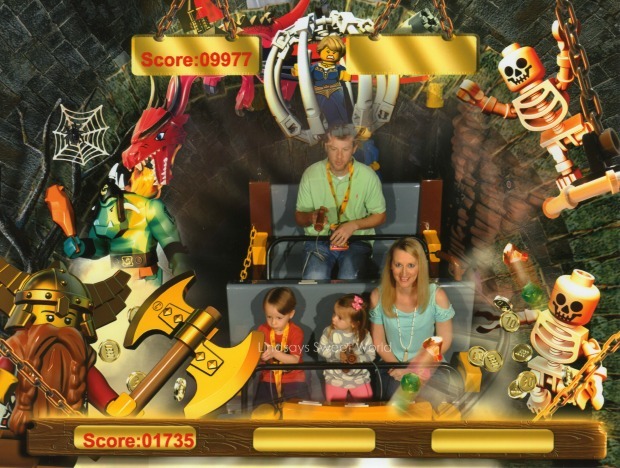 Our kids love Legoland, they can't get enough of it. I think we're headed there in a couple of weeks. You have to have them stay at the Legoland Hotel if you can/they have one, it's one of the coolest experiences, worth the price! That looked like an awesome trip! I wish we had something like the Beltline here in Houston. Just you wait on Legos eating your home alive- we are going to build a table with Lego boards so the kids can keep their collections in one place instead of sprawled all over. Stepping barefoot on a Lego brick is the worst! Sounds like such a fun weekend! 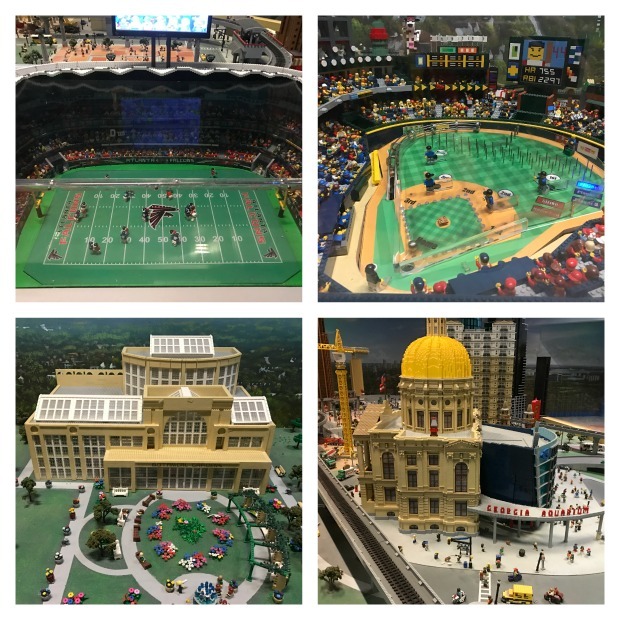 I definitely want to head to Atlanta and take Cam to Legoland. He would love it and so would Emmy. Glad you had fun! I love Olivia's romper. So cute. Legoland looks like it was a lot of fun. I always stay in Buckhead when I go to Atlanta for work. What a cool new mall that you went to. I can't wait to go back and see it! You guys always have the best donuts!!! What a fun weekend - Legoland looks great! I loved following along your adventures on Instagram! You guys found so many great things to do and see. Way to go on the big wins, Jacob!! I love that cars at play wall. Too cool! I have a thing for VW’s. Are you on snapchat? Or do you only use Insta stories? What a fun trip! Mason would love to go to a Lego Land. He’s obsessed with them! And as always, great pictures. OMG. My boys would have loved LEGOLAND when they were little guys. Sadly, it wasn't around yet (or at least not in a nearby city). I grew up near Atlanta and my sister and I used to go there for the weekend and stay with our aunt. Great memories. It looks like you had a wonderful trip! Thanks for linking, Lindsay! Right?! It was so cool! Even I had a fun time! And how awesome that you grew up near ATL. I have lived close to it all my life, and I too, have an aunt that lives there! So neat! Thanks for hosting! I loved seeing the Lego land update so on IG! That place looks amazing! Also are this cupcake ATMs just in the south?! I've never seen one!